Join us for a cookie rally in Thornton on January 26, 2019 from 11 a.m. – 1:30 p.m.
Bring a sack lunch and water bottle. Join us for crafts, cookie activities, and earn requirements toward financial literacy badges. See the cookie prizes, taste the cookies, and play fun games to learn about the Girl Scout Cookie Program! Please RSVP to Heidi Kane at (720) 352 – 5699 or HeidiLKane@hotmail.com by January 19. Join us for some family fun before cookie season! 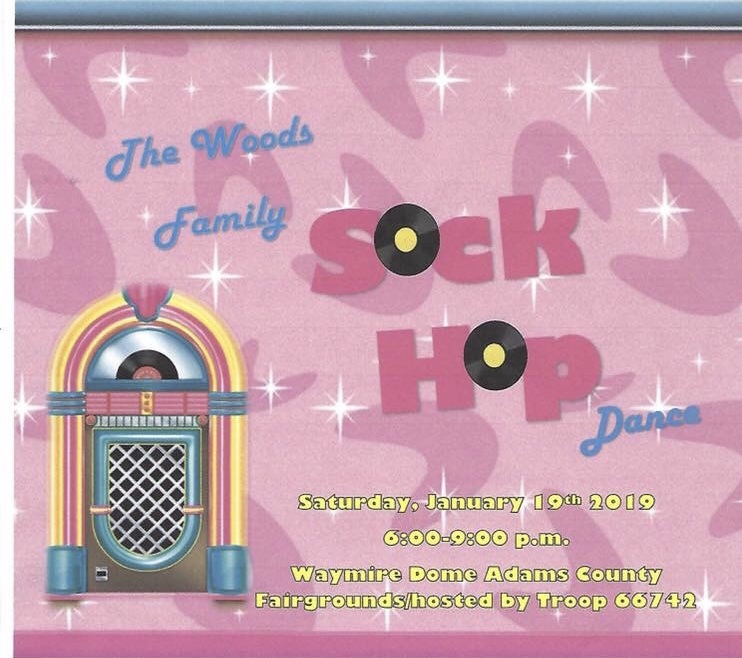 All ages are welcome at The Woods’ Family Sock Hop on January 19, 2019 from 6 – 9 p.m. at the Waymire Dome at the Adams County Fair Grounds (9755 Henderson Rd, Brighton, CO 80601). We will have concessions, prizes to win, and lots of dancing! To purchase discounted tickets in advanced, please visit squareup.com/store/TheWoods646/. For questions, please contact Jordan at (720) 384 – 8420. I have been a Girl Scout for four years. I started Girl Scouts because it sounded fun and I thought I could make the world a better place. The first year of Girl Scouts I was so excited that I had my mom sign up to be the cookie mom. That year I worked many booths, door-to-door, and sold 1,396 packages of cookies. This is where I learned that the more work and heart I put into my cookie business, the better I would do. The next two years I worked harder to pass my goal and get more customers. I found that if I advertised I would get more customers that enjoy Girl Scout Cookies and would support me. Last year was my best year yet, I sold 3,055 packages and was the 11th top seller in the state of Colorado. I was able to earn lots of Cookie Credits to go to Girl Scout Zippers camp. I love Girl Scouts because I feel that it is very important to the world. I have learned how to make new friends, life skills, camp on my own, and most importantly, help other people. Our troop does lots of give back projects such as: valentines for Children’s Hospital, Wreaths Across America, cards to the military, Thanksgiving meal for someone in need, picked up trash on the street, volunteered at a Precious Child and Giving Tree, donated to CASA for kids in trouble, visited the elderly, and helped in my community and school. This is one of my favorite things to do, because I can get my family to help out too and we can all make the world a better place in many ways. Grab your poodle skirt or leather and let’s rock around the clock! It is encouraged that you bring cash for concessions. Questions? Call or text Jordan at (720) 384 – 8420. Troops 66742 and 65791, along with the Woods Service Unit 646, proudly present the “Go For Bold” cookie rally! Walk on the wild side for the 2019 Girl Scout Cookie Program! Girls will inspire their inner goal-getter, go for bold in their marketing, race for money management, root for their favorite cookie, master safety tips, perfect their cookie pitches, and more! Payment due via https://squareup.com/store/TheWoods646 (Payment is your RSVP). Registration closes January 23. Questions? Contact Jordan at (720) 384 – 8420.